This bright, colorful bathroom set is the perfect choice for those wanting a style that is both functional and fun. It brings together simplicity of purpose in a light-hearted design that combines utility and modernity. The set is completed by the frameless wall mirror with its built-in LED strip lighting. The countertop is crafted from matt white AquateX™ which delivers hardwearing durability. 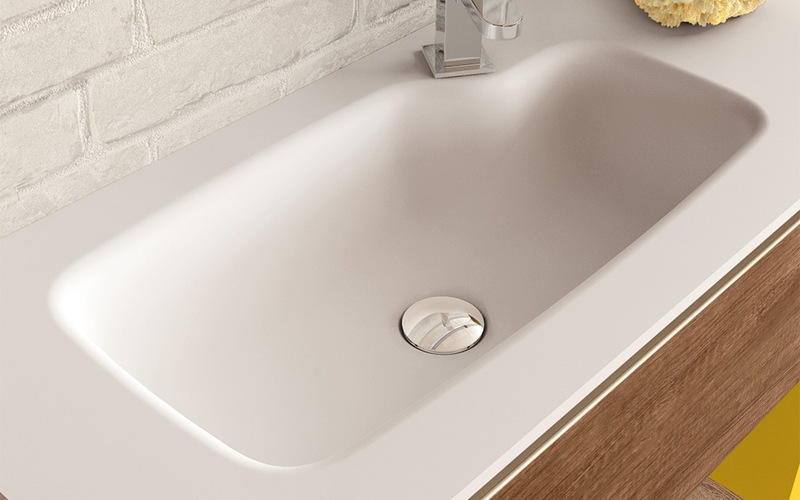 It features the unusual shaped basin – a softly curved rectangle with an inset corner to house the tap. AquateX™ is a unique product with a non-porous surface and high bactericidal properties which ensures ease of cleaning and superior hygiene. The base unit uses the warm wood tones of Tobacco Sherwood composite veneer for its two generous drawers, each with discreet clip handles with subtle metallic trim. A bold surface full of character inspired by the Po Plain oaks and the unmistakable unmistakable language of nature. 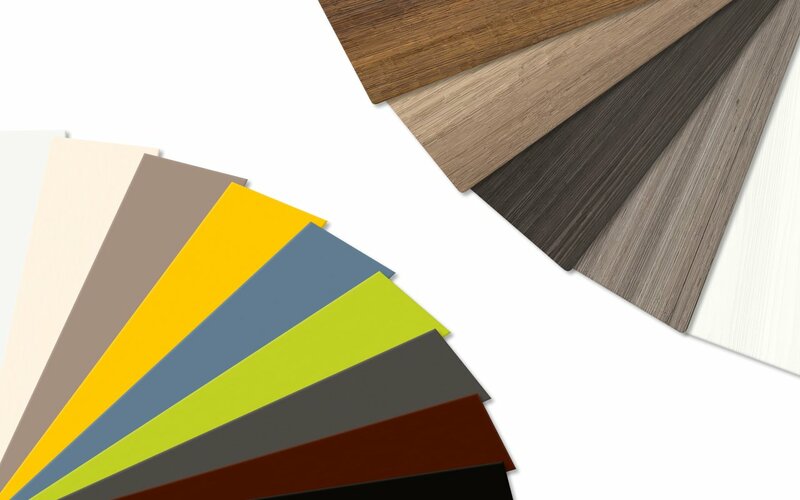 The selected shades allow Sherwood to be used in classic and contemporary spaces, panelling, and fit-outs that require stylish visual and tactile details. 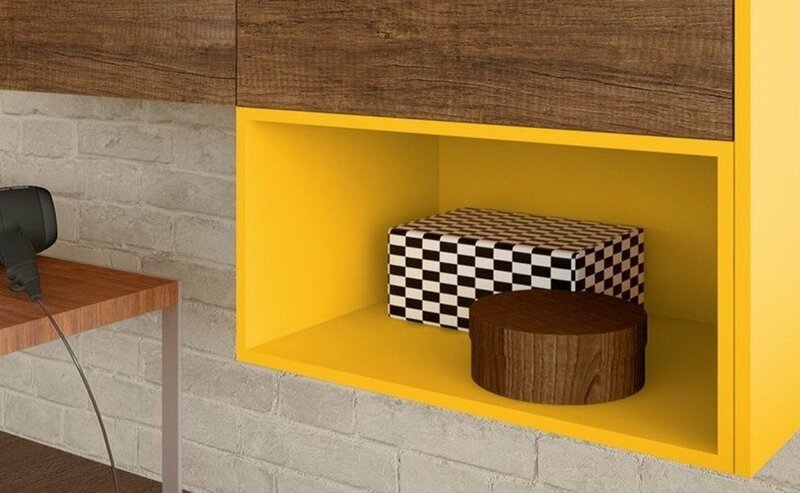 Beneath sits the open-fronted shelf in whimsical, cheery matt yellow lacquer, which is also carried up the side panels of the unit. It is this sunny yellow that really brings the unit to life. 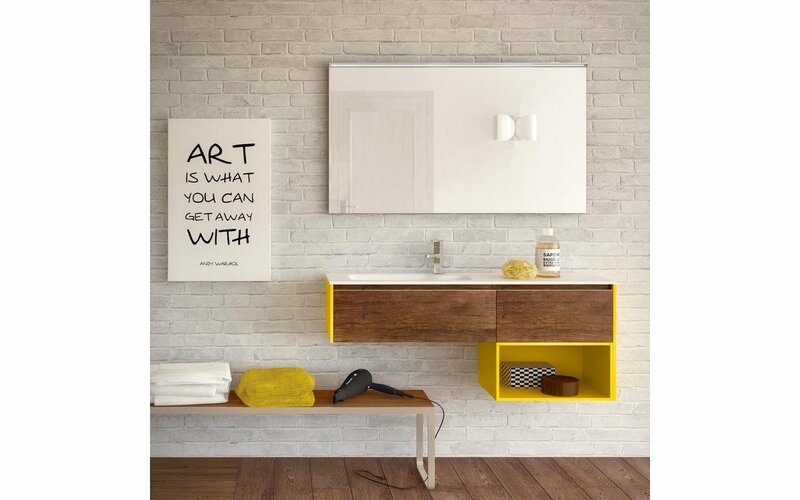 The wall-mount installation of the cabinet together with the bright yellow and white contrasting tones make this whole set light and airy in feel. 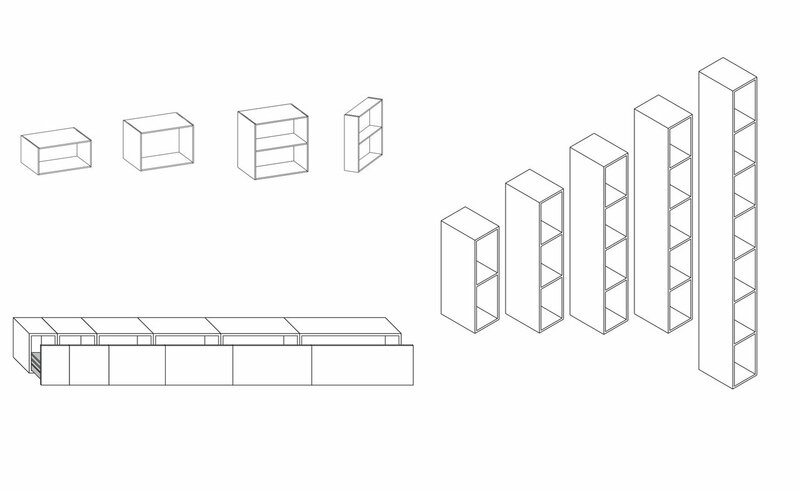 The concept of our furniture compositions sets is founded on versatility and functionality. By designing a whole range of modularised options from open fronted cabinets with shelves, floor and wall units and multi-shelf storage, you can build the perfect solution for your bathroom needs. Extra storage space, more shelves, an additional wall unit, or less shelves and a more minimal look…it’s all possible with our composition furniture range. Simply mix and match the elements until you achieve exactly what you want. 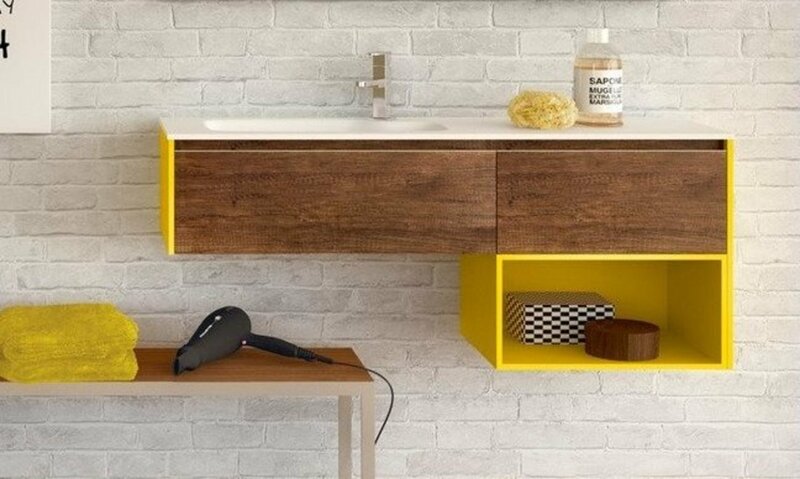 The final element of the Bathroom Furniture Composition 37 is this simple one-shelf. 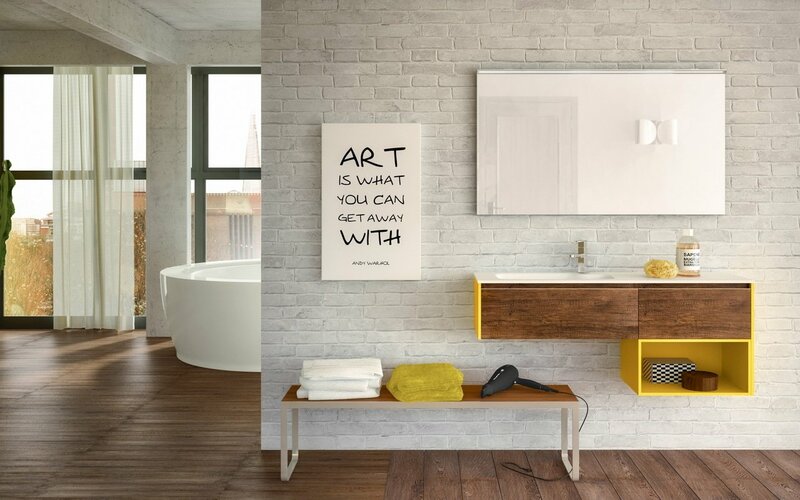 It is finished in lacquered yellow to match the bright style of your new bathroom. This very handy, open-fronted unit provides storage for taller items such as shampoos and creams.